I love the way you love me. But sometimes, unanticipated events can cause a person to adjust priorities. And simple pleasures get lost in the melee. I remember when we would lay on the couch and talk for hours. I would use your stomach as my pillow and ramble on about my boring day at work. Your soft words would soothe my bleak outlook. Reassuring me everything would be ok.
You treated me like nothing else mattered. While at the same time, my diagnosis made me feel like I didn’t matter. My only positive constant was your encouragement. It always neutralized those unhappy feelings. I loved when you would tell me I was pretty. I know it sounds silly but those words were like an intervention on my thoughts. It delivered me from my anxiety. But then you stopped. You drifted away. Other things became more important. Maybe living with so much uncertainty was too overwhelming. I can see how it could be. I have to remember, you have a life too. I must respect that. And watching you constantly deal with my issues shatters my heart into a million pieces. I just hope you know it’s not all my fault. Certain aspects of my life are uncontrollable. Wrestling with my pain puts me in a space where my actions are based on emotion. And on those sad days, I hold my face and stare in the mirror. My tears are so dramatic, it’s like I’m crying in slow motion. While trying to figure out how did I get to this place? Not believing what has happened. Not knowing how to react. But also realizing, I can’t do it alone. So here I am, once again asking for your help. Looking for those encouraging words. Something low and quiet, whispered in that special way. Usually self-affirmations are enough. But now I’m holding out for more. I need your help to keep my hope alive. So tell me I’m pretty, despite my flaws. It will help me make it through the day. Then tell me again tomorrow and I’ll be inspired to stay. Simply tell me I’m pretty. That’s all you have to do. I know I’m hard to love right now, so I’ll make it easy for you. Just tell me I’m pretty. That’s all I want. And I’ll tell you; you’re pretty too. Nicole, you moved me to tears. You are so pretty, your soul is even more so. Your honesty touches my heart. Thank you for having writen this blog. It is just wat I needed to hear today. The need for hope is always there right? I only today I found your blog. I have lived with MS for the last 33 years. It started when I was 27 and now, that I am 62, I feel better than ever! There is life after diagnosis indeed! Thank God! I wrote and just launched the 2nd augmented version of my story: HOPE BEYOND ILLNESS – A guide to living WELL with a chronic condition, where, besides some vignettes of my own journey with my illness, I mainly share tons of the tips that helped me not only survive such a diagnosis and all those crazy capricious symptoms (as you well know) but thrive. This new version is also INTERACTIVE which means it has videos and also audios embedded in the book. It is a whole different experience in reading bc you read while also watching an audiovisual. I’d love to gift you with it. Would you be willing to take a look at it and maybe even write something about it in your blog? I’d really appreciate it bc you have an MS audience and I would really want to touch, help and inspire more people living with MS like us, with it. If you are willing, I would like to know what gadget you read books in so that I can send you the right digital format of the new version. If I had your courage, I would have written this article. You lose control, your dignity, friends, your social life and for someone like me….yourself. Now, I am a widow, my kids call me but, they have their own lives. Or some don’t call at all. Understand….beauty is fleeting. Strength, courage and the ability to help others by sharing yourself is God”s gift of beauty. It is hard to lose anyone because of the non stop problems we have. You are gorgeous in so many ways. Nicole, I was just drawn to you the first time we met because of your beautiful smile. You didn’t talk too much at that time, and I always talk too much. Then I got to really know you through your blogs. You are really incredible no matter how you feel about yourself. You seem to always find the right words for how I’m feeling, but I am unable to express myself. I tried to get your attention at the ampyra meeting, and my husband said you were trying to get mine at the end. I’m sorry we did not get to connect. My family and I participated in the walk MS, but I didn’t find you in the crowd. 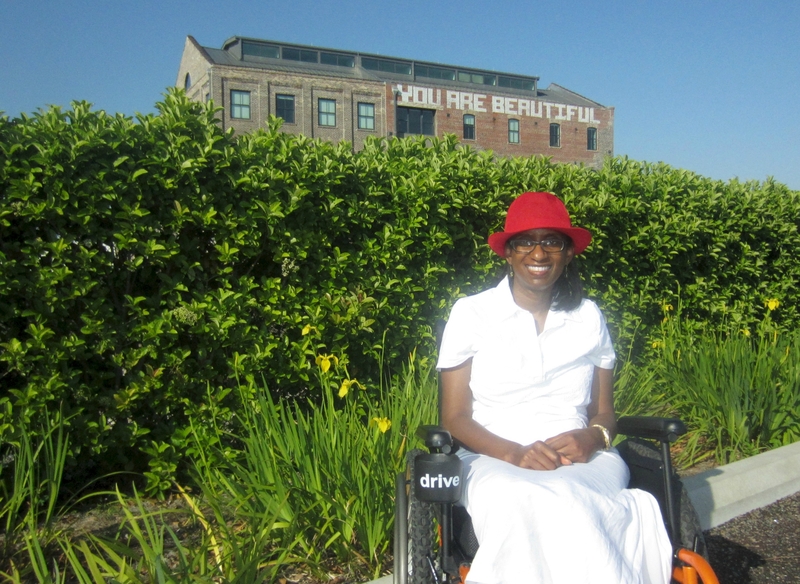 Please know that you lift the spirits of so many of us with MS by your insightful blogs. Hope to see you soon. Beautiful thank you for sharing and inspiring me. Nicole, You are beautiful !!!!!! As always your smile is infectious as well as your beautiful heart. So my dear, that makes you gorgeous on the inside and out. You have the total package!!! Nicole, You are beautiful !!!!!! As always your smile is infectious, as well as your beautiful heart. So my dear, that makes you gorgeous on the inside and out. You have the total package!!! Nicole, I’m sending a hug to a lady who is lovely inside and out. I needed to read this today. I have no visible symptoms, so it’s hard for people to tell that I’m not okay. They see a lucky, happy housewife instead of a woman trapped by pain, fatigue and anxiety. I struggle to choose how much to tell my husband about my day to day condition, because I don’t want to be a burden. And sometimes I desperately need a hug, but my brain decides it’s more important to say words that make me a difficult person to love. I think this blog is probably hard work for you, both physically and emotionally, and I want you to know that I love you for sharing so that so many people can feel connected and understood. This is important work. Thank you. How could anyone look at your beautiful smile and not tell you that you are pretty. How heartfelt and heartwrenching your words are. You are so lovely inside and out!! I feel the same way…. Thank you for sharing. You are beautiful in every way by striving for kindness ! Absolutely speechless- wow! Hugs my gorgeous friend. Soul baring …. thank you for allowing us into your world. Nicole – you are beautiful inside and out.